At 5:40 am on June 27, Shanghai was shocked out of its slumber by the sound of a 13-story tower block crashing to the ground. But the fatal accident may prove a bigger wake-up call for the construction industry, say experts, who have accused building firms of sacrificing quality for quick profits. An investigation report last Friday revealed the collapse had been caused by the foundations being undermined by a combination of dug-out soil being piled 10 m high against one side and the digging of a 4.6-m-deep underground car park on the other. A migrant worker surnamed Xiao, who entered the doomed building to collect his tools, was killed in the collapse, which, lying on its side and with its doors and window almost intact, is a shocking site. It sparked outrage among the 500 homebuyers, many of whom almost invested their life savings in the Lotus Riverside project and are demanding a full refund and compensation from Shanghai Meidu Real Estate Development. More frightening, however, is the fact Shanghai Zhongxin Construction, the firm working on the 11-block Lotus Riverside residential complex in Minhang district, was allegedly warned of the danger by the supervising company hired to oversee the project. 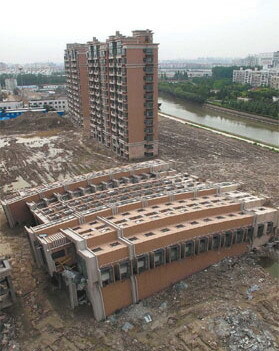 "We warned the construction company many times," said Wang Jinquan, head of Shanghai Guangqi Construction Supervision. "We have been telling them about the mud pile since the end of last year but we have constantly been ignored." He explained that supervisors were in a "weak" position, adding: "We have to eat". He refused to elaborate further. 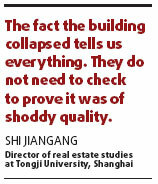 Experts like Shi Jiangang, director of the real estate studies institute at Tongji University in Shanghai say the incident highlights the lack of an effective construction supervision system in China, while others have called for a new independent body to be set up to oversee safety and quality standards. 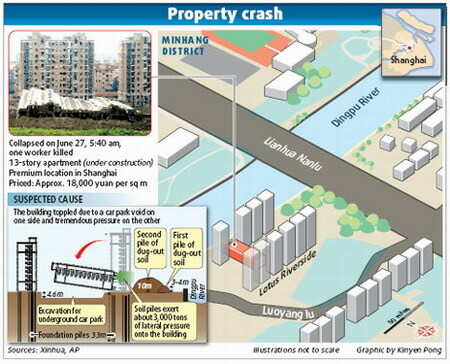 "The fact the building collapsed tells us everything," said Shi. "They do not need to check to prove it was of shoddy quality; it was something the supervisors failed to find out or act upon." Construction supervision was introduced in the 1980s, when ambitious city expansions were just beginning, said Ouyang Guanghui, deputy general manager of Shanghai Project Management, a company that has supervised a variety of projects, including the record-breaking Shanghai World Financial Center. He said that after signing a contract with the developers, teams from the supervision firm visit a site to draw up a "plan of supervision" and then meet developers and the construction company to discuss it, as well as necessary materials, tools and qualifications for on-site staff. Once preparations are agreed, supervisors sign an order to begin work. "The government gave supervisors some power to control quality, but not much," said Ouyang. "The supervisors are hired by the developers and report directly to them about any problems. If supervisors raise any potential dangers but are ignored by the developers, they are expected to inform the local authority's quality control department. "If they do so, and it causes the project to be delayed, the developer might try to postpone or reduce the supervisory firm's fee. Some developers just want construction completed as soon as possible, so they can sell the building and make money." He said building weaknesses would only be highlighted in extreme conditions, such as an earthquake, while for others, such as the case in Shanghai, all it took was a pile of mud and the fact it was rainy season. Sub-standard construction is a major concern in China, where vast infrastructure projects are the norm as the country tries to keep pace with its fast economic growth. In 2006, former deputy minister of State construction, Liu Zhifeng, said the average longevity of a residential building in China was only 30 years. The collapse at the Lotus Riverside complex is not the only one to hit Shanghai in recent weeks, with the pit of an expansion project at the Southern Hotel just 1.5 km away falling last Thursday. It happened during heavy rain and is believed to have caused sinking to nearby residential blocks. Four people were also killed when a bridge in Tieli, Heilongjiang province, crumbled to the ground on June 29. Initial investigations blamed the tragedy on an overloaded truck, while the State Council has ordered local authorities to step up safety maintenance on local bridges. "It is all about money," said Shi at Tongji University. "As the country's property market is booming, developers cut costs to build faster. In choosing between quality and cost, some will go for lower cost and faster progress, sacrificing quality." Building supervisor Wang said not moving the mud pile would have saved the Lotus Riverside developers "about 5 to 6 million yuan ($730,000-880,000)" and explained the construction company had planned to use the mud, which came from the car park dig, for lawns in the complex. In Shanghai, which is developing rapidly in preparation for the 2010 World Expo, 8,000 projects are being built, including 70 million sq m of residential space, he said, adding: "Since May, more than 2 million sq m has been sold every month." Developers have sold around 500 of the 620 units at the Lotus Riverside project, including in the collapsed block, at an average of 14,300 yuan per sq m. Since May, some prices have even risen to 18,800 yuan. "When the property market is booming, profits-driven developers skimp on work procedures and use shoddy products," said Shi. Corruption at a local level is also an issue and the Central Commission for Discipline Inspection of the Communist Party of China revealed last month around 100 high-ranking government officials had been sacked or charged this year, with most cases relating to land transactions and property development. Wang Wei, deputy director of transport for the Xiangxi Tujia-Miao autonomous prefecture in Hunan province, was sentenced to 15 years in prison in January after 64 people died when a bridge under construction collapsed. It was discovered he had taken bribes and had failed to conduct his duty. In February, Kang Huijun, former deputy director of Shanghai's Pudong district, was jailed for life for receiving 5.9 million yuan in bribes to approve land sales and accumulated unjustified assets worth 12 million yuan, while Jiang Yong, former director of Chongqing urban planning bureau, was given a suspended death sentence for taking almost 18 million yuan in bribes. 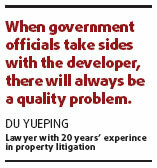 "When government officials take sides with the developer, there will always be a quality problem," said Du Yueping, a lawyer who has dealt with property litigation for 20 years. "We used to have signs at construction sites that read: 'Quality is a priority and life is no joking matter'. You don't see them any more." The Shanghai municipal government is investigating Shanghai Meidu Real Estate Development, a former State-owned firm that went private, after it was discovered several government officials have illegal stakes in the firm. Documents from the city's industry and commerce office show Meidu was founded in 1995, with the State-owned Shanghai Xinmin Real Estate holding a 20-percent share and the Meilong township government holding 80. But after several stages of restructuring, it went private in 2001, when 24 shareholders bought up the township's 80 percent. Most of them, however, work for the government. "It is forbidden by the law but it does happen," explained Shi. With its connections, Meidu was able to buy the land for the Lotus Riverside project at a cut-rate price, paying just 604 yuan per sq m, despite similar land nearby costing 1,929 yuan, reported Southern Weekend. Prior to 2003, when land sales started to be decided through auctions, deals were approved by local authorities and were a large part of its fiscal income, said lawyer Du. Rules to ban civil servants from any involvement in business followed repeated reports of corruption. However, most land in Minhang district, one of the largest in Shanghai, was sold before 2003, while subsequent development has seen it transformed from a sparse rural area to a densely populated suburb. The firm has apologized for the June 27 collapse and is working on a compensation package for residents of the destroyed block. But the incident has led many locals to question whether they are living on solid foundations. "We're getting less calls these days," said Liu Lili, an reality agent for Wanyuan Property, "and those who do say they want properties about five years old. In the past, it was always 'the newer, the better'." More cooperation among government departments is vital to ensure quality during the building boom, said Ouyang of Shanghai Project Management, who explained that quality supervision officials at district level cover supervisor and construction firms, while industry and commerce bureaus and land bureaus cover developers. "In an accident, construction and quality supervision departments will lead the investigation and the construction and supervision firms are more likely to be blamed," he said. "Developers normally take no responsibility but it is sometimes they who do not care about quality. "Departments should work more closely to coordinate on quality and ban developers from buying more land if it is proved they were responsible for an accident. Only then will developers learn their lesson." Du added that an independent third party should be put in charge of quality supervision to plug the loophole in the system. "If the supervision team and developers are bound by money, the supervisors can hardly be objective," he said. 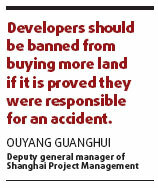 "I have not seen one developer stopped from selling its properties because a supervision team said no to construction. The supervisors are more likely to do their duty if they are not connected with the developer." He suggested quality control professionals should be chosen at random from a national database to reduce the chances of corruption. "Before work starts, the developer should put money into an account that is taken charge of by a quality supervision institution," he added. "That way, it will be the institution rather than the developer that decides whether or not the supervisors should be paid." The Ministry of Housing and Urban-Rural Development failed to respond to questions when contacted by China Daily. However, last week, it announced plans to launch a full safety check of all construction projects under way across China.